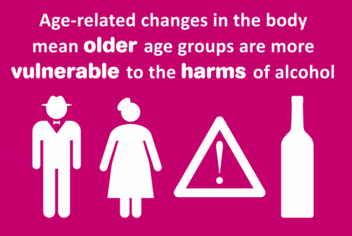 Drink Wise, Age Well – Alcohol Use and the over 50s in the UK – is a report based on initial study findings from the Substance Misuse and Ageing Research Team at University of Bedfordshire and compiled by the International Longevity Centre UK. drinkers, whilst 3% were found to be of ‘higher risk’. • Among those who said they were drinking more now than in the past, the five most frequently reported reasons for the increase are age-related. These were retirement (40%), bereavement (26%), loss of sense of purpose in life (20%), fewer opportunities to socialise (18%) and a change in financial circumstances (18%). • Being an increasing risk drinker is associated with being male, younger, living in Scotland, identifying as LGBT, not having a chronic illness, still being in work and not having further education after school leaving age. The factors associated with being a higher risk drinker include the first four factors listed above, along with living alone, not having a partner, being widowed and having a chronic illness or disability. would not tell anyone if they needed help. considered when forming strategies to reduce alcohol-related harm in this age group.